Our vision of a healthy Multnomah County is when all people have access to the services that support a person’s ability to thrive, no matter what they look like, where they come from, whether they can pay, how they describe themselves, or who they love. Community Powered Change provides pathways to the best health of our communities, acknowledges our histories, empowers us to be our best selves, and creates opportunities for our future generations. Time and again, our communities have raised their voices to say what must change if we truly want healthy communities. Community Powered Change is the result of those voices coming together to create the plan to build a more fair future for everyone. It is a shared effort of the people who live, work, and play in Multnomah County working alongside culturally-specific organizations, the local health department, health systems, and businesses committed to equity. 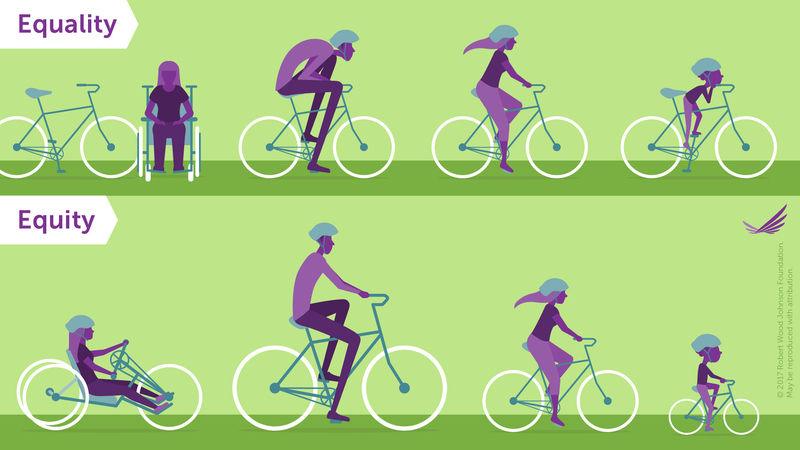 It is important to be clear about the difference between equity and equality. Equity is making sure everyone has what they need to be successful and thrive. Equality is treating everyone exactly the same, regardless of what advantages or disadvantages they might have that others do not.